Are you unhappy with the way your teeth look when you smile? OR, you have teeth which are ground, malshaped, have gaps, broken ,chipped and partially or completely decayed teeth?if yes, then we offer you a FULL MOUTH REHABILITATION NEW DELHI INDIA. if you are planning a vacation to india get your consultation with our team of dental experts for FULL MOUTH REHABILITATION and get a smile makeover you always desired of. we at DR CHOPRA DENTAL CLINIC offer you a solution towards a beautiful and healthy smile. With the judicious use of the various treatment modalities such as laminates, veeners, crowns , implants and gum recontouring we can re-design your smile and give you a more confident smile. THE SERIES OF POSTS WHICH FOLLOW WOULD PUT LIGHT ON ALL THE NUANCES OF FULL MOUTH REHABILITATION. we would discuss about the various steps in full mouth rehabilitation, the cost , the time required and the how to maintain this rejuvenated dentiion for a long time..
AT Delhi, india you can make the most of your dental visit as you get your full mouth rehabilitation and go around to visit the beautiful cities that lie close to the capital of the country. 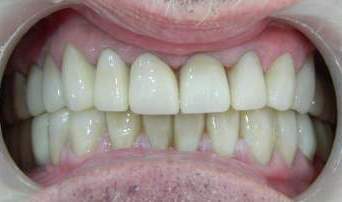 The picture posted in this blog is an actual treated case done at our clinic with th euse of full ceramic crowns, implants and zirconium crowns. we would love to be a part of your Journey in RECREATING YOUR SMILE BY OUR FULL MOUTH REHABILITATION EXPERTISE.